So. Spider-Man. Did we really need a reboot of a series that had the major Hollywood treatment barely a decade ago—spawning three films and countless games, toys and comic book ephemera? Nah. Not really. But then, when you consider how corny and downright lousy Sam Raimi’s Spider-Man 3 was – and certainly parts of 1 and 2, you can understand how producers might want to blot out his missteps with something more palatable to a more discerning under-18s generation. Enter: ‘The Amazing Spider-Man’, deftly directed by Marc Webb (apt surname, right?). The all-important question is, should it exist – and does it have a tangible value as a series reboot? Within the first ten minutes, it hosed down my flaring cynicism; it turns out this is a pretty great hero-flick. Webb’s Spidey is a film of two prongs: one, a tragedy – a very bleak tale about Peter Parker (Spider-Man’s alter-ego) dealing with parental abandonment issues and eventually the deaths of other figures close to him. That’s the teen-angst box squarely checked – and frankly, it feels right given Parker actually spends the bulk of this film balancing out nerd-loner high school pressures against being an outcast vigilante hero. The ‘Twilight’ comparisons are already starting to crop up – and we kind of see why. Thankfully, Spidey squats over that series and plants a steaming one squarely on it. Garfield might be too hunky to play the feeble nerd, but his charm and acting skill really sell him as Peter Parker. Ladies will swoooooon. 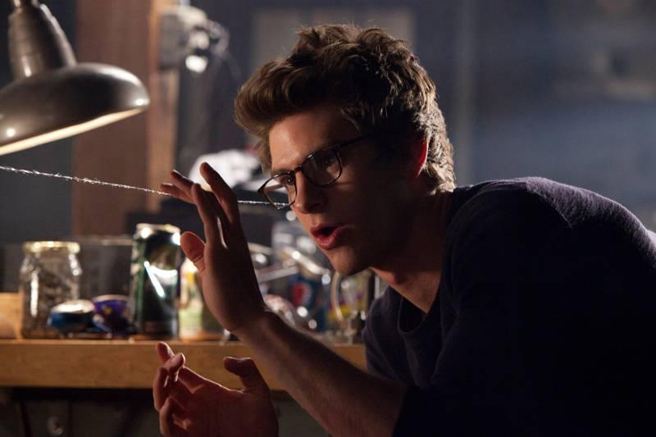 Andrew Garfield takes over the lead role from Tobey Maguire – and in some ways, he’s a great fit. If anything, he’s still too pretty to be convincingly cast as a nerd, despite carting around a vintage camera and occasionally spouting scientific babble. Sorry, but when your biggest concern is that one jock kind of picks on you and, oh, damn my perfect jawline and smouldering, put-upon shyness, you’re not really roughing it. The gawky Maguire we believed; Garfield we kind of just give a pass to because he’s really likeable anyway. Emma Stone looks every bit the early comic book Gwen Stacey – all eyes and fringe and knee-high boots. She also looks too old to be a high schooler and definitely carries herself with an excess of maturity and confidence. That’s great for gender-positive female characters but feels wrong in a high school context. Of course, Stone is a bang-up actor, delivering her lines with perfect authenticity and stealing scenes from her co-stars. More than the two leads, who work well and definitely have chemistry, it’s the support cast that genuinely impresses. Martin Sheen and Sally Field are warm and natural as Parker’s surrogate guardians, adding decades of screen credibility to the cast. So too does Denis Leary as Stacey’s father – eventually a key figure late in the film. Emma Stone’s Gwen Stacey is endearing. Call me, maybe? Guys will swoooooooon. Remember how I said this was a film of two prongs? If the first is the emotional backbone running through the narrative, the second is the popcorn-munching blockbuster. There’s a bit of silliness that you’ll have to swallow – an over-reliance on fake 3D holographic controls (totally in vogue right now) and silly pseudo-science involving meaningless algorithms, mutations, giant lizards (well, one: the villain is Spider-Man classic ‘Lizard’, played well by Rhys Ifans) and convenient plot devices that are all-too-obviously called out to the audience. Again and again. Really, that’s all pretty much par-for-the-course for most superhero movies, save perhaps Nolan’s Batman saga. But what Spider-Man really nails is the excitement of Parker learning to master his powers. The first half of the film is entirely costume-free and better for it. The second half is a joyous, vertigo-inducing tour of skylines, zoomed through at impossible angles and face-stretching speeds. There’s so much web-play (with Spidey’s new synthetic web shooters – another nod to the comics) that you might be forgiven for starting to tune it out by the end – but that actually speaks for how convincing the effects are too. Swings and roundabouts, eh? The Amazing Spider-Man earns his mask and gives fresh legitimacy to a fan-favourite brand. There’s a warm sense of humour to the whole story, balancing out the darker elements nicely, and just enough originality to sidestep being a rehash too. Not quite ‘amazing’ then, but there will always be a deserving audience for rock-solid superhero movies done with this kind of heart and care. Next postShotgun Critic joins 2008’s biggest social networking phenomenon!